Four Country Case Studies were developed in 2018 as part of a series on the national adaptation planning (NAP) process in selected countries. The purpose of the series is to provide an update on the current NAP process, showing first lessons learned and giving an outlook on the next steps to be taken in the iterative NAP process, considering how it contributes to reaching the countries´ adaptation goals. The case studies shall furthermore serve the purpose of peer learning to countries that are planning or just starting the NAP process. Most adaptation actions are local and closely related to development needs, so it is important to develop and use local monitoring and evaluation (M&E) systems to capture what is happening on the ground and integrate lessons from this into national and global M&E systems. This new briefing by the International Institute for Environment and Development explores how learning from the local to national level informs planning and reporting from the bottom up, providing stronger evidence for adaptation assessments. Drawing on experience in Mali, Senegal, Morocco and Kenya, it unpacks how effective vertical integration of subnational and national M&E can improve national planning and lead to more robust reporting while saving time and resources by making use of existing data collection mechanisms. Learning from robust local-level evidence can improve the contribution climate adaptation interventions make to achieving sustainable development now and into the future. Integrating climate adaptation into devolved national planning will lead to more resilient development and help achieve synergies in climate actions delivery. To leave no one behind, we must know what works where, when and for whom. Developing bespoke climate adaptation M&E that ensures learning from the local level informs national-level planning and reporting will make national and global assessments more robust. Although systemising results from a range of scattered local adaptation actions remains a challenge, combining information across scales can improve planning. Please read the full policy brief here. Learn more about how governments will need to think differently about how they monitor and evaluate their adaptation initiatives if they want to keep sustainable development on track in the brief “How integrated monitoring and evaluation systems can help countries address climate impacts” here. The SNAP tool addresses decision-makers and technical experts from ministries as well as NGOs and other stakeholders. It provides guidance for developing a snapshot of the planning capacities that are currently available. Thus, it helps to identify the country’s point of departure for initiating the National Adaptation Plan (NAP) process. When preparing for NDC implementation or even a future NDC iteration, a stocktake of existing capacities, ongoing activities and adaptation needs forms the basis for identifying strategic goals. The assessment is conducted through a one- or two-day workshop involving key stakeholders. Now available in Arabic: The Role of the NAP Process in Translating NDC Adaptation Goals into Action – Linking NAP Processes and NDCs. The Risk Supplement to the Vulnerability Sourcebook introduces the IPCC AR5 risk concept and provides guidelines on how to conduct risk assessments using the Vulnerability Sourcebook’s approach. The Supplement is now availaible in Spanish – Suplemento de Riesgo para el Libro de la Vulnerabilidad – and Arabic – ملحق المخاطر – التابع لكتاب المصادر الخاص بالقابلية للتأثر. This new publication by GIZ further adresses the connection between the NDC and the NAP process in order to combine efforts in mainstreaming the multilaterial framework on climate action in place since 2015. With the adoption of the 2030 Agenda for Sustainable Development and the Paris Agreement in 2015, adaptation is now firmly on the international agenda. In the lead up to the 21st Conference of the Parties (COP21) of the United Nations Framework Convention on Climate Change (UNFCCC) in Paris in 2015, Parties to the Convention agreed to submit intended nationally determined contributions (INDCs). In doing so, they outlined their commitments to reducing greenhouse gas (GHG) emissions and had the option to also include adaptation. Unless countries chose to amend their INDCs before ratifying the Paris Agreement, these documents became their first nationally determined contributions (NDCs). As of 17 May 2017, a total of 140 NDCs (165 INDCs) (on behalf of 145 countries) were submitted to the UNFCCC, of which 104 NDCs (145 INDCs) included adaptation. 39 (55) of these specifically refer to the NAP process as being planned or already in progress. However, the Least Developed Countries Expert Group (LEG) to the UNFCCC has reported that 85 countries, including 45 Least Developed Countries (LDCs) have actually begun the process. As of 17 May 2017, most of the 145 countries that ratified the Paris Agreement made little or no change to adaptation-related content in their NDC. These countries are now considering how NDC adaptation goals can be operationalised through implementing existing national adaptation strategies and plans or how developing national adaptation planning processes could support NDC implementation. This is the first in a series of briefs by the NAP Global Network and GIZ focusing on alignment of country efforts under the 2030 Agenda for Sustainable Development, the Paris Agreement and the Sendai Framework for Disaster Risk Reduction. These represent key national policy processes that can advance climate-resilient development by facilitating systematic consideration of climate change in decision-making. At the country level, national governments are working to operationalize the commitments under these agendas. They are country-led, context-specific policy processes that elaborate how individual governments, in collaboration with civil society and private sector stakeholders, will contribute to achieving the global goals set out in the various agendas. Alignment of these different processes can increase coherence, efficiency and effectiveness towards development outcomes that are resilient and sustainable. Many countries recognize the value of aligning relevant policy processes; however, they struggle to understand what it looks like in practice and how it can be achieved. This introductory brief aims to increase understanding of the concept of alignment for climate-resilient development at the country level. Mexico’s coastal wetlands are key for people’s adaptation to climate change . The project “Adaptation and Blue Carbon” is the first adaptation project funded by the national Climate Change Fund created by the General Law of Climate Change. The BMU-IKI project Mainstreaming EbA, implemented by GIZ, supports the communication of its success story. Learning from each other’s success – this is the concept of the PANORAMA – Solutions for a Healthy Planet partnership initiative – funded by IKI and GEF – to document and promote examples of inspiring, replicable solutions across a range of development topics, including climate change adaptation and ecosystem management. During Adaptation Futures 2018, GIZ and IUCN hosted a dialogue session showing that inspiring and replicable solutions can be found everywhere on this planet and that EbA solutions are an effective reply to climate change risks and deliver a multitude of benefits for societies, economies and environment. The Tool for Assessing Adaptation in the NDCs (TAAN) is an interactive knowledge platform that provides detailed information on adaptation in the (I)NDCs. In particular, it demonstrates objectives, priorities and vulnerabilities as well as country adaptation actions and measures as indicated in the (I)NDCs. The new section labelled Data gives the user the possibility to access data concerning specific questions related to adaptation in the (I)NDCs. It is particularly designed for science and think tanks. A myriad of quantitative and qualitative analyses is accessible across a multitude of different indicators and can be further configured using different filters. The tool offers an opportunity to see the distribution of the selected criteria among regional groups and download the relevant data and graphics. Besides this new function, the online tool comprises of two other sections, i.e. country information and quick facts. Here, sampled information was pre-selected for a quick overview of the adaptation content of (I)NDCs as well as country-specific data which can be downloaded in country factsheets. Access the new section of the tool here. 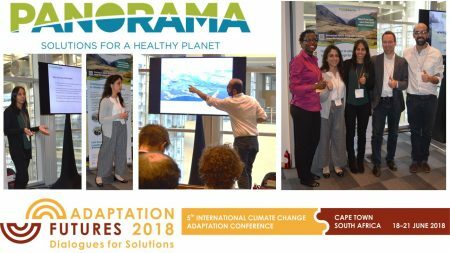 From June 18 to 21, Adaptation Futures 2018 will convene over 1,000 scientists, practitioners, business leaders and policy-makers from around the world in Cape Town, South Africa, to discuss climate change adaptation. On Tuesday, June 19, GIZ is hosting a Side Event “Linking the NAP process and NDCs to accelerate enhanced adaptation action”. The event will discuss how to assure that existing progress on NAP process, knowledge and methodology be linked to the implementation and further iterations of countries NDCs, guided by best practices in this regard, in order to accelerate enhanced adaptation action including adaptation finance. It is thus situated within the larger context of integrating the post 2015 agendas into coherent national development plans and policies for sustainable and climate-resilient development. A new report developed by GIZ provides an overview of available public and private financing sources to implement and sustain EbA measures. It highlights ten practical and illustrative examples to inspire project developers and practitioners interested in exploring different ways to access resources and engagement models for EbA financing. What are challenges and potentials of mainstreaming climate risk management into infrastructure investment planning? How can the mainstreaming of climate risk management into infrastructure planning serve NAP implementation? How can the use and provision of Climate Information and Services serve national adaptation planning and what are the associated challenges? On Wednesday 2nd of May 2018 from 11:30 a.m. to 2 p.m. these questions will be adressed in an event titled “Climate Risk Management for Infrastructure – Building Adaptive Capacity and Furthering NAP Implementation” organised by the World Federation of Engineering Organisations (WFEO), Engineers Canada and the Deutsche Gesellschaft of Internationale Zusammenarbeit (GIZ) GmbH in collaboration with the Ministry of the Environment (MMA) Brazil and the Ministry of the Environment and Energy (MINAE) Costa Rica, as well as the German Meteorological Service (DWD). The objective of the event is to share and discuss the experiences of Brazil and Costa Rica in strengthening infrastructure resilience in the context of their national adaptation planning and to examine the challenges and opportunities of mainstreaming climate risk management into infrastructure planning. One key challenge discussed is that of enhancing the provision of, access to and use of the necessary Climate Information and Services in this context. The port of Itajaí (Brazil) and the Guardia Bridge (Costa Rica) are presented as case studies of the application of the Protocol for the climate vulnerability assessment of infrastructure, developed by Engineers Canada. They serve as practical example for climate risk assessments as essential element of climate risk management. Contact: No registration or SBSTA accreditation required. To facilitate logistics, please kindly contact Katharina Lotzen (katharina.lotzen@giz.de) or Darrel Danyluk (mrdjd48@gmail.com) if you are interested in attending. SAFE THE DATE: We invite to the 2nd webinar within our current discussion series on financing EbA. Click the link to register for webinar: Register to join the Webinar. Before joining, be sure to check system requirements to avoid any connection issues. Please find the recording of the webinar here. How to achieve the adaptation goals contained in the Nationally Determined Contribution (NDC) in practice? On AdaptationCommunity.net we already present various tools for supporting policy-makers and key stakeholders in their efforts to develop, implement and evaluate adaptation measures. The GIZ Climate Policy Support Programme has developed a toolbox compiling all these tools and organizing them along a policy cycle on behalf of the Federal Ministry for Economic Cooperation and Development (BMZ). Furthermore, the Toolbox comprises two cross-cutting enabling factors, which are essential for the implementation of NDC adaptation goals: “Governance and Institutions” and “Capacity Building”. Finally, “NAP Process Country Case Studies” illustrate country implementation examples and related lessons learnt. Through the Lima Call for Climate Action, Parties were invited to communicate their adaptation planning efforts in their Intended Nationally Determined Contributions (INDCs). Unless countries chose to amend their INDCs prior to ratifying the Paris Agreement, these documents became their first Nationally Determined Contributions (NDCs). As of October 2017, 162 countries have submitted NDCs of which 120 include adaptation. Now, after the Paris Agreement, governments turn towards translating their NDCs into action. Against this background, a new tool developed on behalf of the Federal Ministry for Economic Cooperation and Development (BMZ) informs about the various adaptation contents in the NDCs. A Quick Facts section which provides answers to relevant questions about the (I)NDC adaptation components enabling users to access key statistics around (I)NDC adaptation components. The section includes general infographics that summarise the most important data from (I)NDC adaptation components and a subsection devoted to aggregated sector-specific information. A Country Information section with an interactive World Map, which allows accessing country-specific information. In this section, users may explore the content of and the differences between various (I)NDC adaptation components and compare measures that are planned and have been undertaken by different countries. Moreover, users may access individualized country factsheets. Even though EbA is recognised to hold considerable potential to strengthen climate adaption, it is still yet to be fully mainstreamed into development policy and practice. Valuation can provide convincing – and usually much-needed – evidence of the benefits of investing in ecosystem-based approaches, in themselves, and in comparison (and combination) with grey measures. It offers a tool to guide better-informed decision-making, which results in the delivery of more inclusive, effective and sustainable climate adaptation actions. GIZ has developed a sourcebook (and training module) to assist in building awareness, knowledge and capacity about why, how and in which contexts EbA valuation can be used to inform, guide and influence adaptation decision-making. The sourcebook combines information on valuation theory and methods with 40 real-world examples and practical steps for commissioning, designing and implementing EbA valuation studies. The Risk Supplement to the Vulnerability Sourcebook (PDF) introduces the IPCC AR5 risk concept and provides guidelines on how to conduct risk assessments using the Vulnerability Sourcebook’s approach. The Vulnerability Sourcebook (PDF) provides step-by-step guidelines to conduct robust vulnerability assessments according to the IPCC concept of vulnerability. Since its publication in 2014, it has been widely used for vulnerability assessments in the framework of climate change adaptation planning from the local to the national level. The Fifth IPCC Assessment Report (AR5) moved from focusing on vulnerability to focusing on risk of climate-related impacts that may harm a system. To account for this change, in 2017 this Risk Supplement has been developed. The chapter offers an introduction for practitioners working at the community level who are interested in advancing their knowledge about Monitoring & Evaluation. It also serves as background reading for GIZ’s adaptation M&E training course. Authored by Timo Leiter from the project “Effective Adaptation Finance (M&E Adapt)” funded by BMZ, the chapter is part of the book “Enhancing adaptation to climate change in developing countries” published by the African Centre for Technology Studies Press. This webinar, which took place on the 14th June 2017, explores how countries are developing national monitoring and evaluation (M&E) systems for adaptation in context of the National Adaptation Plan (NAP) process. Results of a survey of country needs and experiences regarding M&E from the NAP Global Network are presented along with the country example of South Africa’s national adaptation M&E system. You can watch the recording and view the presentations online at the NAP Global Network website. We are pleased to announce the release of our new website, designed with a user-friendly navigation and updated with new information and topics. 1) Which EbA-relevant tools exist already and have been used successfully at different stages of the mainstreaming cycle? 2) How to adopt existing tools to an EbA context? 3) How to make these tools available to a broader audience? In addition to the webinar recordings, an outcome paper on EbA-relevant tools and methods and a list of further sources is now available here. What if we could learn from each other’s success? The EbA Solution Portal fosters sharing of field-proven knowledge and experience on Ecosystem-based Adaptation in different regions and ecosystems around the globe. It shows that inspiring and replicable solutions can be found everywhere on this planet and that EbA or “green solutions” are a state-of-the-art-reply to climate change impacts and deliver a multitude of benefits for societies, economies and environment. This new global exchange platform under the PANORAMA initiative was officially launched at CBD CoP 13 in Cancún. Now the portal is open to connect practitioners and decision makers and to solution providers from all countries, sectors and levels to share their stories. The 3rd webinar Identifying and prioritizing EbA Options within the discussion series on EbA-relevant Tools & Methods will take place on November 24th, 4.00-5.30 h pm CEST. We look foward to seeing you online! Please click here to enter the webinar room. The EbA webinar recordings are available here. The Stocktaking for National Adaptation Planning (SNAP) tool was developed by GIZ to assess, enhance, and monitor a country’s capacity for adaptation planning. This publication showcases the utility and use of the tool and highlights results from its application in various geographical terrains on national and subnational scale. The SNAP tool is one of the most widely used tools in GIZ’s armoury of support instruments for the National Adaptation Plan (NAP) process. Target group are NAP focal points, technical support units for NAP, donor agencies, organisations supporting NAP planning, and the wider public interested in the NAP process. The publication can be downloaded here in English. With the Vulnerability Sourcebook the GIZ has developed a very useful tool to enhance adaptation to climate change. This practitioner’s manual offers a step-by-step approach to conduct vulnerability assessments and monitor and evaluate changes of vulnerability over time. It can be applied from the local to the national level and to a broad range of sectors – as successfully done in Burundi, Mozambique, Bolivia and Pakistan. Besides that it is a very useful tool for further implementation of the National Adaptation Planning (NAP) process. Download the Vulnerability Sourcebook now in French or Spanish from this website. The publication contains eight modules, which provide detailed guidance on how to conduct a vulnerability assessment. They cover the preparation phase, the development of impact chains, the selection of indicators, how to gather the necessary data, how to process this data for vulnerability assessments, and how to present the findings. Furthermore, the Vulnerability Sourcebook highlights how practitioners can use vulnerability assessments for monitoring and evaluation (M&E). How can countries track and report on their adaptation progress at national level? What is the purpose of national adaptation monitoring and reporting and what does it look like in practice? How can it support learning and decision making? At the Side Event, pioneering countries will present their approach followed by an interactive fishbowl discussion with the audience. NAP Align is an analysis tool designed to help countries align their national adaptation plan (NAP) processes with their overall national development goals, as well as budgets. It forms a supplement to the NAP technical guidelines developed by the Least Developed Countries Expert Group (UNFCCC) and provides further details of several steps outlined in the NAP technical guidelines. NAP Align highlights the importance of taking both the planning procedures and the budgeting framework of the country into consideration in the earliest stages of the NAP process. NAP Align is targeted at various practitioners involved in the NAP process, including NAP multisectoral coordination committees, task forces and working groups. It assists them in analysing the individual country’s development planning and budgeting processes to find entry points for the alignment of NAP. It also describes the links between planning and budgeting cycles, particularly those regarded as central to adaptation planning. The analysis comprises a set of questions which cover the following topics: development planning, donor coordination structures, financial and budget planning, financing climate change adaptation, medium term expenditure frameworks, and the budget cycle. La GIZ et l’Observatoire du Sahara et du Sahel (OSS) vous invitent au webinaire sur Les Fonds Nationaux pour le financement climatique. C’est le deuxième webinaire d’une série de quatre qui vont avoir lieu entre Septembre et Décembre 2014 traitant des différents sujets en relation avec la préparation pour des financements climatiques. Le webinaire sur Les Fonds Nationaux pour le financement climatique aura lieu mardi le 7 octobre de 14.00 à 15.30 (CET)*. Pour participer, veuillez-vous inscrire via ce lien. Ce webinaire est disponible en français seulement. Veuillez-vous assurer que le logiciel Java 6 est bien installé/activé sur votre navigateur et utiliser un casque à écouteurs. Pour vous assurer que votre système corresponde à toutes les exigences techniques, procédez à une vérification du système. Nous vous prions de tester bien en avance l’accès au système. The GIZ and the Observatory of the Sahara and the Sahel (OSS) are pleased to invite you to the webinar on The national funds for climate financing. It is the second of a series of four webinars that will take place between September and December 2014, covering various topics related to Climate Finance Readiness. The webinar on the structure of climate finance will be held on Tuesday, the 7th of October, from 14:00 to 15.30 (CET)*. To participate, please register via this link. The webinar will be held in French. Please use a headset and make sure that Java 6 software is installed/enabled on your browser. To make sure your system meets all technical requirements, perform a system check. Please test well in advance your access to the system. Last Tuesday, 10th June, GIZ and IIED hosted a side event on “Measuring and reporting effective adaptation: challenges, approaches and ways forward“ at the UNFCCC SB40 in Bonn, Germany. More information and background material can be found in the Knowledge section. Christoph Feldkötter, GIZ (left); Susanne Schwan, GIZ; Susannah Fisher, iied; Nguyen Huong Thuy Phan, Mekong River Commission; Irene Karani, LTS Africa; Gottfried von Gemmingen, BMZ. Update: The recording of the webinar can be accessed here. We are pleased to invite you to the webinar “Insights into National Adaptation Planning” which will take place on 26th May, from 10:30 am to 12 noon (CEST). It is the first session of a series of webinars for stimulating the technical discussion on the NAP process with a wider audience and in addition to the existing international conferences. The presentations are followed by a detailed Q&A session. The webinar will be held in English. To participate, please click Access Webinar, enter your name, your email-address and click “Join webinar”. This webinar is the first event in the new public Discussion Series on the NAP process organized by the Climate Protection Programme for Developing Countries implemented by GIZ on behalf of the German Federal Ministry for Economic Cooperation and Development (BMZ). In order to support focused adaptation efforts in agriculture, GIZ commissioned a detailed study about how different crops are affected by climate change. Impacts do not only depend on the type of crop and its location, but also vary during a plant’s stages of growth. In addition, different aspects of climate change can have different adverse, but also beneficial effects. Detailed knowledge can help make the right decisions. Fact sheets are now available for download for each of the studied crops – rice, maize, coffee, and sorghum and millet. They will give you an overview about how complex the effects of climate change can be. The full study, which is forthcoming, will elaborate on the effects and their consequences in more detail. CIFOR’s study on climate change impact chains in coastal areas, funded by the Federal Ministry of the Environment, Nature Conservation and Nuclear Safety (BMU), was presented already in two webinars this year. The final report has been finished just in time for the holidays and is now available for download on AdaptationCommunity.net. In the study, you can read how five different stressors may create hazards and affect the vulnerability of coastal ecosystems: ocean acidification, ocean warming, precipitation, sea-level rise, and tropical storms. Of course the study points out a vast body of academic literature that can be used to inform planners in even more detail. Abstracts and methods are provided in an extensive annex. For practical use, it is also accompanied by two short policy briefs: one about the potential of ecosystem-based adaptation strategies in Indonesia and the Philippines, and another one giving a quick overview of the impact chains for those who are short on time. This fair amount of reading should keep you busy for the next two weeks, when this website will be a bit quieter due to the Christmas holidays. For those of you who celebrate it, AdaptationCommunity.net wishes you a merry Christmas, and a happy New Year to you all! Our animated film “We know enough about climate change” explains the basics of climate change and how mitigation as well as adaptation will be necessary in the future. This week we added three new translations to the eight that had been available already. On GIZ’s YouTube channel, the film is now available in Hindi, Bengali and Tamil. Another recent addition is the Mongolian language version, which viewers might have already noticed. At the 19th Conference of Parties to the UNFCCC in Warsaw this month, GIZ-IMACC co-hosted a side event with the Climate Knowledge Brokers (CKB) Group. The discussion covered an important topic: How can we make use of the growing amount of climate information and knowledge websites that are available? There is a risk that the growing number of different information services might confuse people who need to understand the impacts of climate change rather than informing their decisions. Find out more about the Climate Knowledge Brokers Group in our article and watch a video recording of the debate. Successful adaptation needs long-term planning. AdaptationCommunity.net now devotes a new section to the National Adaptation Planning (NAP) process which was devised at the COP16 in Cancún. NAPs are meant to complement short-term adaptation projects by building long-term adaptive capacity, and can be a powerful tool to guide the process of adaptation. AdaptationCommunity’s section on NAPs provides an overview of the UNFCCC’s NAP support structure and links to more detailed planning guidelines. It also outlines the different tools and materials offered by GIZ that help adaptation planners define and implement strategic adaptation needs and goals. A new page on AdaptationCommunity.net is dedicated to our partner project, the Climate Impacts: Global and Regional Adaptation Support Platform (ci:grasp in short). It describes in more detail how ci:grasp can provide knowledge about the impacts of climate change to adaptation practitioners and support them in their decisions and planning. The updated version of ci:grasp has been made available at http://pik-potsdam.de/cigrasp-2/. ci:grasp was developed by the Potsdom Institute for Climate Impact Research (German abbreviation PIK). The discussion series on Climate Change Impact Chains in Coastal Areas will continue with a second webinar beginning of October. The Center for International Forestry Research (CIFOR) will join us to present their latest knowledge about climate change impacts in coastal zones. Come and join the debate! We are pleased to invite you to the second webinar conducted under the study Climate Change Impact Chains in Coastal Areas. CIFOR have created a literature review about the latest insights into the impacts of climate change in Coastal Areas, which will be presented and discussed in the webinar. Furthermore, we will discuss the usability of the results for planning adaptation interventions in coastal areas as well share our experiences with adaptation in in coastal zones, and ecosystem-based adaptation in particular. To participate, please follow the links to either the session on 1 October or 2 October, enter your e-mail address, choose “attend in browser” and access the webinar. Technical requirements: Please use a headset and enable Java in your browser. To make sure that your system matches all requirements, conduct a system check. For technical support click here. We highly appreciate your participation in this webinar in order to make the study results as useful as possible for you! Five new Method Briefs have been contributed by the community to the collection of Methods Briefs. They are now available in the Knowledge section of the AdaptationCommunity.net. Friends from Mexico, Peru, and Bolivia will contribute their experiences with mainstreaming adaptation to our discussion series in a Webinar on 21 May, 4pm CEST. Come and join the debate, the more the merrier! The discussion on capacity development and training will continue with another webinar on 16 May 2013 at 9am CEST. There will be a panel discussion, but no snacks, due to technical constraints. The webinar is open to all, as always! I am happy to invite you to the above webinar of our discussion series on Mainstreaming Adaptation. It continues the discussion on capacity development and training as a means towards effective adaptation and will feature a panel discussion on the topic. To participate, please click Webinar 9.00 am (CEST), enter your email-address, choose “attend in browser” and access the webinar. This discussion series forms part of the knowledge exchange on AdaptationCommunity.net. For the recordings of previous webinars of the discussion series on Adaptation Monitoring & Evaluation and Climate Information & Services please click here. We are pleased to invite you to the webinar “Getting up to speed – Introduction to Adaptation M&E”. What is adaptation M&E and what benefits does it have? How can M&E of adaptation be approached at project and national level? What challenges does M&E of adaptation face and how can they be addressed? The presentation is followed by a detailed Q&A session. To participate, please click Webinar 8.30 am (CET) or Webinar 3.30 pm (CET), enter your email-address, choose “attend in browser” and access the webinar. This discussion series forms part of the knowledge exchange on AdaptationCommunity.net. Other topics are Climate Information & Services, Mainstreaming Adaptation and Training for Climate Change Adaptation.